A Unisex White Waffle robe is sure to please everyone. Made of 100% Natural Cotton it features two front pockets and a built in self-material belt with double belt loops. 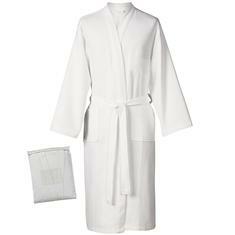 The robe hits mid calf and comes packed in a clear PVC zippered bag with handle. Includes up to 7 thread colors and 5,000 stitches. Popular with Hotels, Travel Agents, Spas and Corporate Retreat Promotions.